What is plastic blow molding process ? | Silver Python Machinery Co., Ltd.
What is plastic blow molding process ? 1. which several method of plastic blow molding? There are five kinds of plastic blow molding methods: extrusion blow molding, injection blow molding, stretch blow molding, multi-layer blow molding and foam blow molding. 2.What is plastic blow molding process? What should we consider when mass production(suggestions from Silver Python Machinery)? Once you choose a good molding method, the molding process is basically determined. In addition, the mass production of blow molded products, should also consider the operation of the molding process and should be equipped with auxiliary equipment. Operation methods are: manual operation, semi-automatic operation, fully automatic operation. The following issues should be considered when equipped with auxiliary equipment. 1) whether the raw materials are dry, should take technical measures. 2) offcut waste disposal methods, reuse methods and technical requirements. 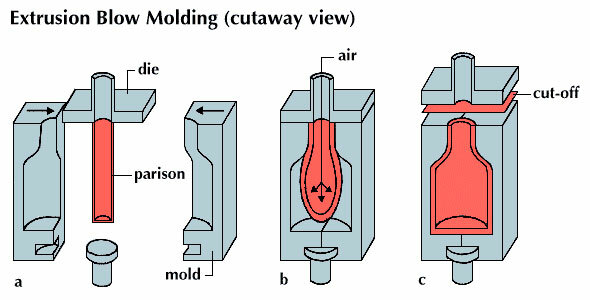 4) Blow molding or injection mold temperature control. 5) Drying of compressed air and selection of pressure. 8) blow molding quality (dimensions, pressure, anti-leakage, resistance to environmental pressure cracking, etc.) inspection methods, methods and tools.